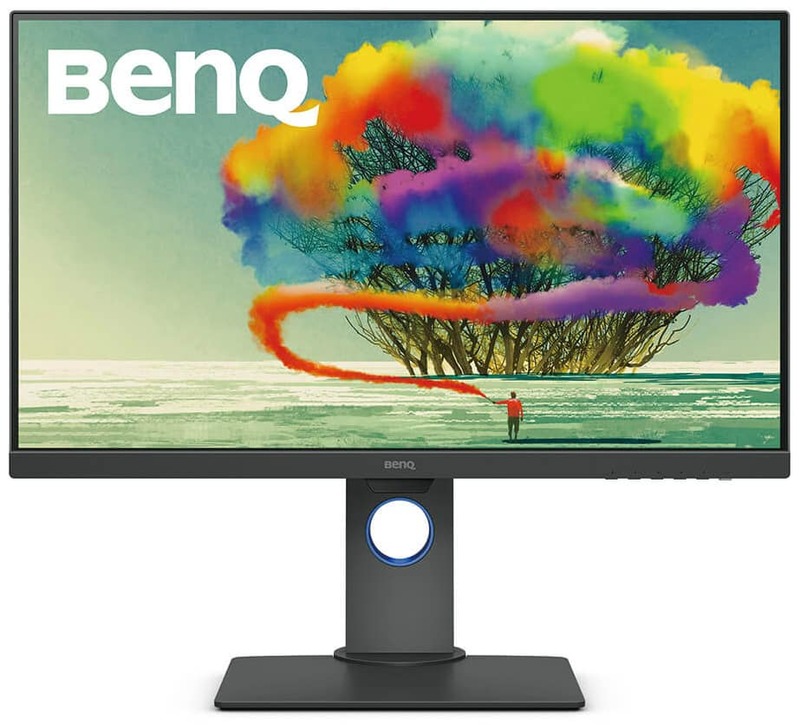 The BenQ PD2700U is a reasonably-priced 4K professional monitor that aims to provide excellent image quality for editors and creators without breaking their bank. This model doesn’t offer Adobe RGB or specialized gamut filters, but its feature set is in no way limited or meant for simple home and office use. The BenQ PD2700U promises exceptional imaging performance for its price range, but how does it stack against its competition in a highly contested segment? 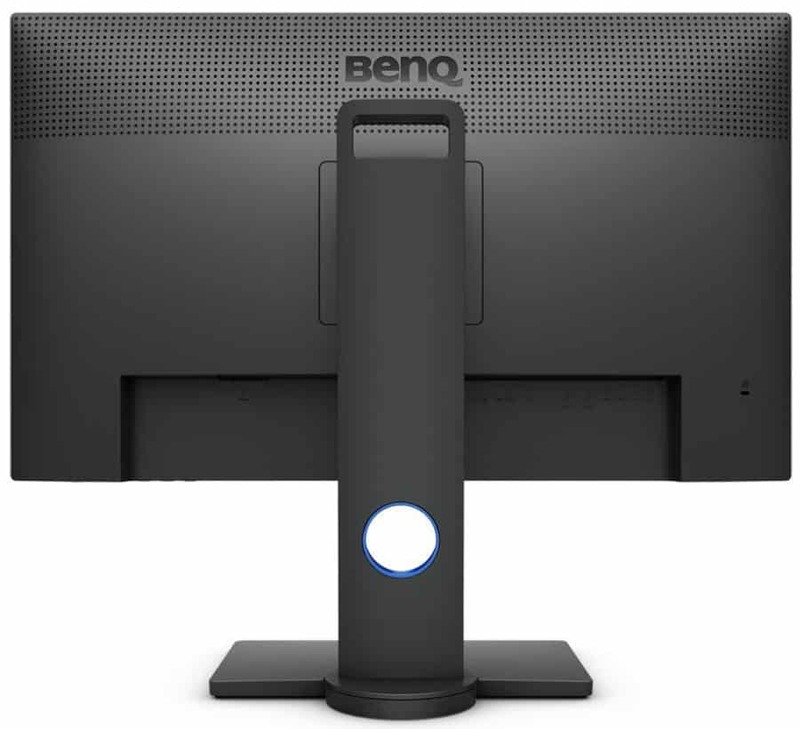 The BenQ PD2700U keeps the PD line’s simplified design which encompasses solid build quality and sleekness. The monitor is finished in matte black that has a nice texture which helps to prevent smudges and dust from building up. The face is bezel-free thanks to a dual stage design, although panel borders are still present on the three sides. 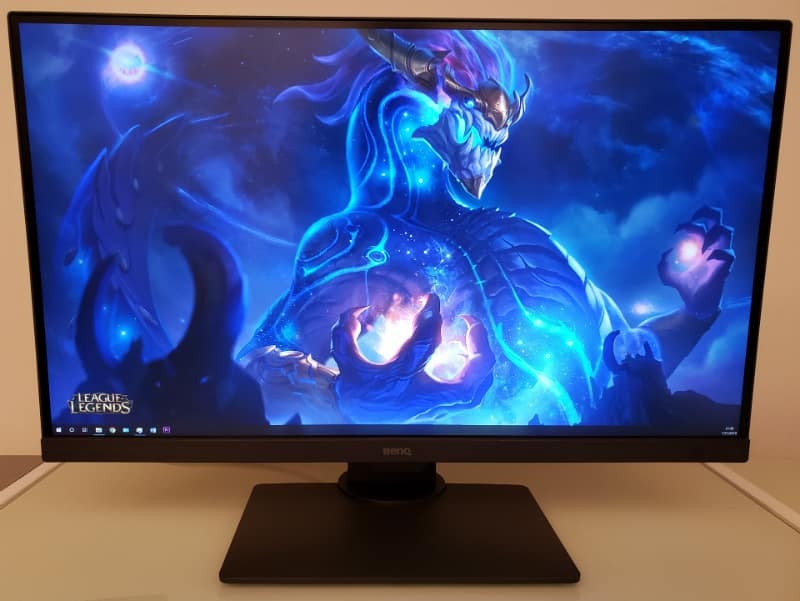 The BenQ PD2700U isn’t ultra thin like the latest premium monitors, but its cabinet has reasonable proportions which make it ideal for wall mounting. Using the included stand will take up only nine inches of depth, so placement should be easy for most. The device ships disassembled, but putting it together takes more or less five minutes since no special tools are necessary. The stand assembly has some good weight to it thanks to metal inserts which provide stability and durability. The weight bias at the bottom of the device guarantees that the BenQ PD2700U will stand upright all the time without the chance of toppling over. As mentioned, build quality is extra solid and quality control for every part of the product is top-notch. One thing we dislike about the BenQ PD2700U’s functionalities is the company’s use of OSD buttons instead of a joystick. Some of BenQ’s illustrious displays have S-Switch pucks which are amazingly convenient while adding a cool factor the device. You can, however, avoid the trouble of using buttons by downloading DisplayPilot from the website to make some controls easier. One of the highlights of the BenQ PD2700U for productivity is its rich I/O layout which we know creators will find useful. The main video input slots include DisplayPort 1.4, Mini DP 1.4, and HDMI 2.0, along with a third DP 1.4 Out slot for daisy chaining. The latter is something all professional displays should have since multi-monitor setups are now becoming less uncommon. There is also a generous amount of USB 3.0 slots on the BenQ PD2700U which offers KVM switching capabilities so users can control two PCs with a single PD2700U. We like that BenQ even managed to squeeze in a pair of 2-Watt speakers for low volume listening, however, for gaming or entertainment purposes a separate set is warranted. The BenQ PD2700U sports a 27-inch IPS panel with a 3840 x 2160 resolution, 60Hz refresh rate, and a 5ms response time. The screen is powered by a 350cd/m2 backlight and is rated to produce a 1300:1 contrast ratio for excellent depth and range. BenQ places emphasis on color quality for this device, so they opted to use a 10-bit color interface for it. The screen is perfectly crisp and sharp thanks to the tighter pixel pitch of 4K screens squeezed into a 27-inch diagonal. This characteristic helps productivity, but it weighs down heavily on GPUs and may sometimes require scaling for some users. It’s slightly more difficult to use the BenQ PD2700U for reading, but apps have the extra room to stretch and expand your workspace. 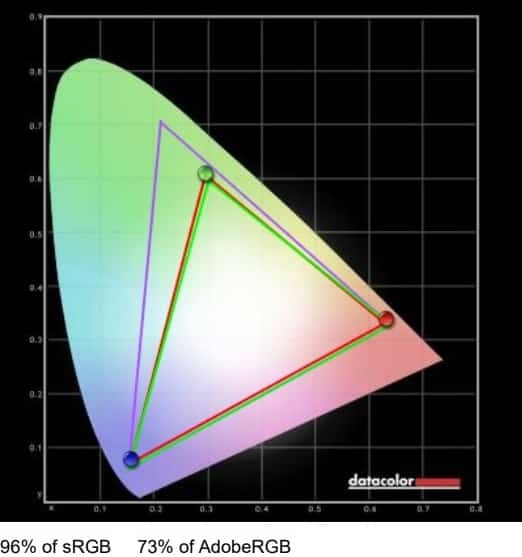 The BenQ PD2700U shows mixed results when scrutinized with a DataColor Spyder Elite V. The color coverage only reached 96% sRGB which isn’t bad, but a bit disappointing considering the display’s emphasis on the color profile. You need to switch to the display’s sRGB mode to snap it closer to 100%, although the difference will be minimal for typical use. Color accuracy fares better with a default Delta E of 2.5, although it falls short of being perfect for a professional sRGB monitor. The score is being affected by the panel’s poor color uniformity which showed massive deviation at the bottom quadrants. The BenQ PD2700U should be capable of better scores if the specimen had a cleaner screen, but we think its great that the monitor still managed a DE of only 2.5 despite this flaw. We were unable to measure contrast consistently, but the BenQ PD2700U averaged at around the 800:1 to 900:1 which is decent for an IPS monitor. However, BenQ rated this display with 1300:1, so we expected something better or similar to LG’s Nano IPS capabilties. This limitation combined with the slightly lower Gamma made blacks look grayish when it viewing the monitor in low-lit environments. The screen could get bright when needed, reaching a maximum illumination of 345cd/m2 at 100%. However, the panel’s color uniformity suffers heavily above 50%, severely limiting its capabilities in bright rooms or offices and studios. Again, this aspect varies between unit to unit, so we know there are specimens which have substantially better outputs in circulation. The BenQ PD2700U can be used for gaming, but that is not its main purpose. The monitor doesn’t handle motion well since fast-paced games like Rainbow 6 Siege showed blurs and ghosting which was noticeable to most of our staff. Slower paced games such as The Witcher 3 fare better since less panning and swiping are involved in the gameplay. This model also doesn’t have any Adaptive Sync solutions which is sorely needed when gaming at a 4K resolution. You are going to need a meaty GPU and some tweaking and testing to ensure that frames remain stable to avoid stuttering. Input lag averages at 15ms which is reasonable for a professional display so there are no noticeable delays unless you are used to gaming at a competitive level. The BenQ PD2700U is a superb monitor if you consider its pricing and capabilities as a professional solution for creators and designers. Our review unit had issues in uniformity which affected its colorimeter scores, but it still managed a tighter color accuracy out of the box than most. To us, that is a good sign that BenQ’s factory treatment has its merits which ensures that a better specimen will reach expectations. The monitor’s connectivity and utility are excellent, although we wish BenQ used a better implementation for manipulating the display. Gaming performance is acceptable at best, but the PD series isn’t popular as an entertainment category anyway. The BenQ PD2700U is excellent for design, video editing, and photography, but after-hours gamers have to look elsewhere.